I saw her again this morning. I wrote a poem about her over twenty years ago. I hadn’t seen her for years and I was astounded to see that familiar hunched figure ride by me on my walk this morning. She’s older now, obviously, but I recognised her immediately, the too-big helmet lopsided on the head, and especially the hunched figure pedalling by. Here’s the poem, unpublished and forgotten, until I saw her again today. or the wind across the unmown lawn. that is never quite here. On my walk this morning, along the bay near Safety Beach, I looked away from the sea for a moment, and there was a picnic table half-hidden in the ti-tree. A concrete picnic table, and the stump foundations of the benches that must once have been located along either long side. A forgotten little object, never important even on the day it was built, and mossy monolithic concrete now. But, for me, there’s always been something about these lost and abandoned places. I’ve written about this before; on Abandoned Picnic Places, Buried Things and The Lost Highway but for some reason they still move me somehow: the transience, the hopefulness, the idea, I’m not sure. I do think that there’s something particular about the picnic place too; that families, or couples, or friends sat here by the sea, in moments that are long gone now. I was sad this week to hear of the passing of Roger Bannister, the English athlete who famously broke the four minute mile in 1954. I grew up a little after that, in the shadow of World War II, the British Empire’s last gasps, the ascent of Everest and the four minute mile. Bannister, boyish looking, amateur athlete, running around the track at Oxford, represented a particular Englishness for me, partly because my father was a runner and told me these stories too. I remembered this week that I’d written a poem that included Bannister a few years ago, so I thought I’d include it here, now. wont get you through all this. I was really pleased to have some new poems of mine included in the latest issue of Eureka Street online. Click on the image above to read the poems in the November issue. I’ve had a long held dream to promote some means for teachers to get hold of contemporary Australian poetry, for classroom use, and this week I learned that the Australian Poetry Library was attempting to do just that. Funded by the Australian Copyright Agency, there’s none of my poetry there, but there is a pretty good range of poets with extensive range of poems: 1600 from Les Murray, over 700 from Peter Porter, nearly 500 p oems from Diane Fahey. Downloading is a little clunky (PDF by PayPal) and maybe they might have been better going for a broader spread of poets (they’ve closed the site to new poems I see) and spent a little more time on better searching, but it’s a pretty impressive start. You then select a location, or use the location feature on your phone to find poems around you now. The actual poems themselves are a bit plain looking, given the nice entry to the app, but it all works. The Disappearing is an innovative new app for iPhone, iPad and Android that (literally) explores poetry and place. Transform the world around you with new poems by some of Australia’s finest poets, who’ve created a poetic map charting traces, fragmentary histories, impressions and memories. Beginning with a collection of over 100 poems about Sydney, The Disappearing will stretch across Australia during 2012. Along with previously unpublished poetry, The Disappearing features exclusive videos of readings and interviews with poets. Users can upload their own poems to The Disappearing, preserving ideas, emotions and experiences about their own environment that vanish over time. I love the idea, but I’ve been half in love with disappearing landscapes for ever. Witness my Suburban Margins Project. So, I’ll be following this project with interest, and maybe contributing too. Or maybe I’ll make some new maps of my own. Ah, paper. There’s something about you. I’m keen on technology and I love the potential for communication that the internet brings. Even love my iPad. But there’s something about good ol’ paper. 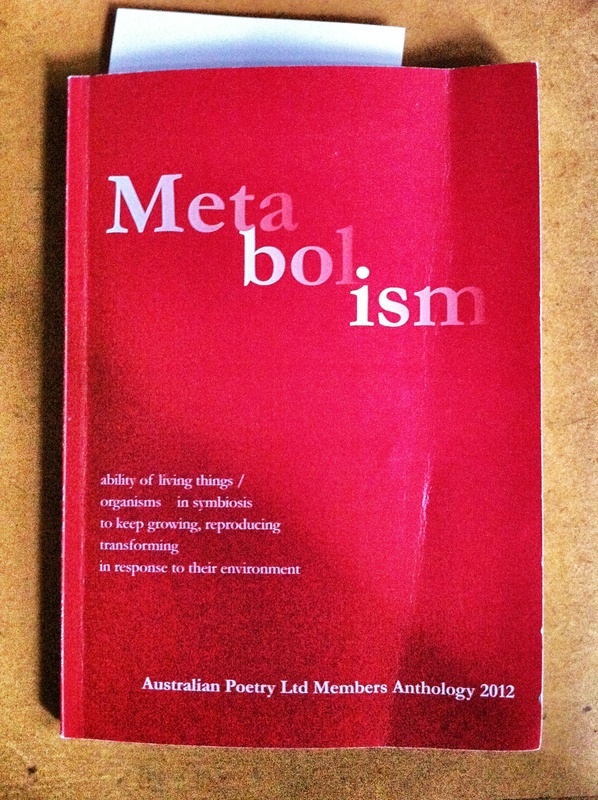 As I remembered this week when my copy of the Australian Poetry anthology ‘Metabolism’ appeared in the mailbox. I’ve had the downloadable version for some time, and I’ve blogged about that before, but there was something nice about getting the printed version. It was a bit damp from the rain we’ve had, and the cover was a bit bent where the postman had jammed it in to a slot that was not meant for poetry books, leaving a crease in the front and back cover that’s never going to squash away. But that’s paper. And part of what a book is.